I’ve been reading blogs for a few years now. I enjoy following other peoples lives and reading their thoughts. I used to view my blog reading as a waste of time and some of it is. Do I really need to know what someone I went to church with 7 years ago and didn’t talk to much then and haven’t been in contact with since is doing? Not really, but yet I still read their blog once in a while. Even though some blogs are a waste of time, I’ve come to realize lately how much I have actually learned from blogs. I can honestly some blogs have changed the way I think on all sorts of levels. There are a few blogs on my blog list that are definitely not a waste of time. One of them is Money Saving Mom. It is a deal blog but it is also so much more. Crystal from MSM, is a blogger, homeschooling mother of 3 and very inspirational. She is always trying to motivate and help others to become better. Some of the things that I have learned from her are to set goals and write them down, how to be a better money manager, how to spend less on groceries (I’m not sure if she still does but at one point she was feeding her family of 5 for $40 a week! ), easy ways to eat healthier, freezer cooking, all sorts of DIY ideas (sometimes things I had never thought that you could make yourself), and overall time management. 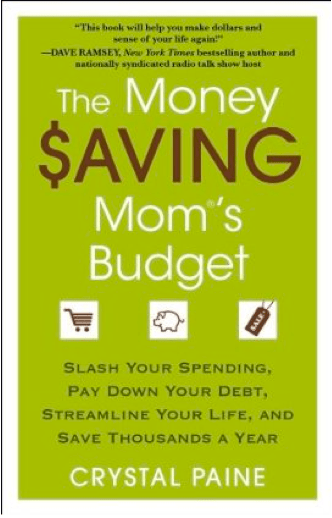 Now Crystal has written a book called The Money Saving Mom®’s Budget. The following is the book description from Amazon. In the first few chapters, you’ll learn how to set big financial goals and actually follow through with them, how to organize your home and life so you can have more time to focus on getting your finances in order, and how to implement a realistic cash budget system that can transform your financial situation. After laying the foundation for financial success in the first few chapters, Paine then teaches you step-by-step how to cut your grocery and household expenditures by 30% to 50%. You’ll learn both basic and advanced couponing techniques, 25 practical ways to save money on groceries without clipping coupons, how to buy prescription glasses for under $20, how to dress your children for free, and much more. If you think living a frugal, simple and debt-free life means you can’t ever enjoy dining out, entertainment or vacations, guess again! From money-saving vacation ideas to secrets to dining out on a budget, this book shows you how to enjoy strategic splurging — and how to do it at half the price. Sprinkled throughout the book are testimonies from people whose lives have been transformed through the principles Paine shares. You’ll be inspired, challenged and motivated to spend less, save more and make the most of what you have. It comes out January 10 and I’m excited to read it as I’m sure I will learn something that will improve not only my finances but also my life. If you’re interested in reading it you can pre-order it here. I’m saving up my swagbucks to buy it since it won’t fit in our budget right now. (I’m pretty sure Crystal would approve.) Whether you read her book or not, check our her blog, but only if you want to improve yourself in some way.